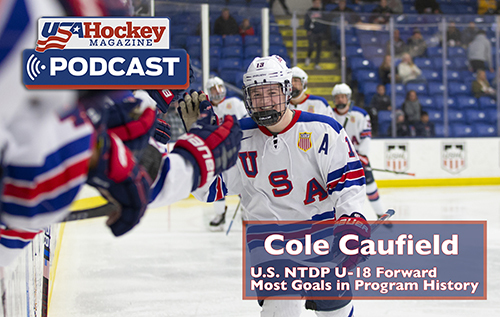 This podcast features Cole Caufield, forward for USA Hockey's U.S National Team Development Program Under-18 National Team. Caufield, who has the most career goals at the NTDP with 108, is committed to the University of Wisconsin and poised to be selected in the upcoming 2019 NHL Draft. Caufield talks memories from playing in the USA Hockey National Championships, this special U-18 group, the IIHF Men's Under-18 World Championship in Sweden and much more in the latest episode of the USA Hockey Magazine Podcast. Follow us on Facebook, Instagram, and Twitter for more from USA Hockey Magazine. Stay tuned for our next podcast, which goes live Thursday, April 11.